I came across this site (myheritage.com ) recently courtesy of booksnobbery. After only a week, the curiosity got the best of me. Not sure why it’s titled “My Heritage”, I didn’t really bother to read if there is an insinuation I share an ancestory with these people. I find the results abit odd. Though while in my twenties, I cannot tell you how many times I was told I looked like Meg Ryan…so no surprise there. I can even do that "Huh..." expression. No kidding, it got me out of a speeding ticket ! WISHING I looked more like Lee Young…I guess the program has a “what you would look like 20 years younger, thinner and Asian” feature. Yea, would kill for that hair, imagine brushing through it at a whim without a drop of detangler and it flowing in the breeze like you see in a beach-setting photo shoot. I bet she doesn’t have to buy Paul Mitchell “The Conditioner” in the half gallon size. Dont know who Cindy Margolis is – I’m guessing a “Housewife of a Gated Community in a Large City” ? She’s not that cute, so not even googling her. But the “Inner 13 Year Old MJ” is giddy about being matched up with Daniel Radcliffe !!! I have often thought that Hogwarts Academy would have been the perfect incubator for me. Oh, how much I could have learned from Snape ! Growing up, I somehow knew boarding school was the place for me, though the choices of that era were mind-numbingly dull. Not quite what I had in mind...though Jo and I could've run amok ! That being said, I have much in common with Harry….I’m thinking possible second cousin? Harry has a scar on the forehead in the shape of a zigzag lightening bolt. I have a scar above my left eyebrow in the shape of a straight lightening bolt. His parents passed away and was raised by an aunt and uncle. Many years of my misguided youth, I lived convinced my parents were merely nice people chosen to raise me while my real parents fullfilled their noble destinies saving the universe or something. At a young age, Harry began to realize he had amazing abilities. Me too ! Harry chose to use his powers for good. Ok, jury’s still out on that one. Don’t judge – I have to keep up my “Evil” credentials or I get bumped down to “Average Run of the Mill Stepmom” status. Hilarious, I’m going to check it out for myself! Too funny! 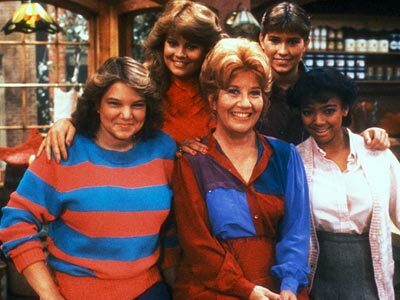 By the way, I loved Facts of Life! Poor Tootie though, what an awful name! LOL! Thanks – I loved that Tootie skated everywhere! Why do I love that ????? The meatloaf cupcakes is hysterical on two levels – the kids know I love cupcakes, and our little one actually loves meatloaf so she’ll get a kick out of it…I’m doin’ it !!!! I am going to do this right now! RIGHT NOW! Its a hoot, eh? Let us know how it turns out ! Thanks for keeping it under wraps….. Funny, I was just over at your blog commenting ! Even funnier is the fact that I can totally see how the two of you look alike! Did you live in a tiny room under the stairs? No, but we did have owls in the backyard I pretended were mine! Eerie similarities: you and Harry…did the owls deliver messages? Well, they were quite menacing, surprising large birds so I tried to stay away, they seemed to be watching us….but what was interesting were the bird-watchers started showing up and hanging out with binoculars…..
Oh, MJ! The husband has a fever and I’m trying to not wake him up so I tried to stifle my giggles but when I got to the part about Snape I could hold it in no longer and WAHAHAHAHA!!! This is so funny! I have no idea, but my ego is huge now ‘cuz those women are gorgeous (tehehe, I’m about as pale as you can get). Let me know if you try this! I apologize to the hubby, hope he feels better soon.